Taiwanese American musicians and artists unite to benefit for efforts to relief the catastrophe caused by Typhone Morakot in Taiwan last week. This announcement came through via TaiwaneseAmerican.org. All proceeds made from these artists' events and merchandise sales until August 31 will go toward relief funds. YellowBuzz gives a shout-out to all artists and organizers involved in this benefit! 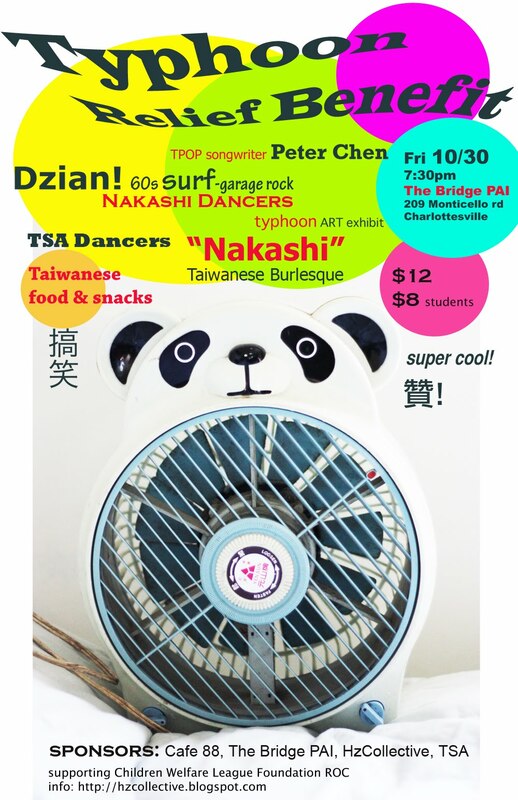 Taiwanese American Artists & Performers Contribute to Typhoon Relief Efforts! As of Sunday, August 16th, the government has reported over a hundred deaths and countless injuries in Taiwan due to Typhoon Morakot. Our hearts go out to the many families suffering. Indeed there has been agitation and different emotions as more developments unfold in Taiwan, but we call on Taiwanese America to see this as a time to stand together as a global community. Showing their true colors of generosity and compassion, many previously mentioned or highlighted artists on TaiwaneseAmerican.org have risen to the occasion! Until August 31st (or other mentioned dates), the following artists have offered to donate a percentage of all their sales to typhoon relief efforts. (Proceeds will be directed towards several of the coordinating organizations and charities that TaiwaneseAmerican.org has mentioned previously.) These artists are doing some amazing and interesting things within our community! Check them out and contribute to Taiwan relief by supporting them with purchases! We also saw Kelly spitting spoken fire in Los Angeles earlier this month. Check out Kelly's website at http://www.yellowgurl.com for your daily dose of wisdom and sass. All the proceeds from any CD's and chapbooks bought on http://www.yellowgurl.com/store from now until Tuesday, August 18th to the Taiwan Relief Fund! Act fast! With exciting news of his long-awaited "American Me" CD Release Party on September 12th, Dawen has generously offered us a space where TaiwaneseAmerican.org T-shirts will be selling next to a venue-matched Taiwan Relief donation box. If you're in the Los Angeles area, check it out! The prolific and ever so talented children's book author of Where the Mountain Meets the Moon is also donating portions of her book sales! Feel like rocking out and giving to a good cause? Eric Hsu, lead vocalist from Johnny Hi-Fi, has upped the ante and offered to donate $2 from each ticket, CD, and merchandise sale from two upcoming performances at the Taiwan Fest in Canada (Toronto on 8/29 and Vancouver on 9/7)! If you're in the area, this is a great opportunity to give back and enjoy an amazing concert! For those that just want to donate by clicking, check out Jenton! A rising YouTube sensation, Jenton has entertained us with his vibrant, likable personality, keen vocals, and such songs like "Taiwanese Night Market". Author of the poetically-written and recently-published novel, Water Ghosts, Shawna is donating a portion of her book sales if you forward her your receipt by email. An easy way to do this is to buy your copy online before August 31st at: http://www.amazon.com/Water-Ghosts-Shawna-Yang-Ryan/dp/1594202079 then send an email to shawnayangryan@gmail.com. Tracking sales is not automatic, so don't forget to email! You've seen several of the works of music video producer and independent filmmaker Karen Lin, but she's so behind-the-scenes, you often don't know that she's behind some amazing videos out there. On the side, she's been working on some independent film productions, and her current project will be set in Taiwan. Buy a DVD copy of her first award-winning short film, Perfection, and she will donate 50% of the proceeds!